Geographically, Siberia includes the Russian Urals, Siberian, and Far Eastern Federal Districts. The north-central parts of Kazakhstan are sometimes included in the region. Siberia has population density of only three persons per square kilometer. The oblasts with the highest population densities are Chelyabinsk Oblast and Kemerovo Oblast, with 41 and 30 persons per square km, respectively. Koryak Okrug has population density of less than 0.1 per square kilometer. Click here to see the complete list of districts and territories. 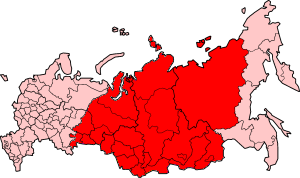 Excluding territories of north-central Kazakhstan, Siberia thus has a total population of ca. 38.7 million (2005). The North Kazakhstan oblast has another 1.1 million inhabitants (2002). About 70% of Siberia’s people live in cities. Most city people are crowded into small apartments. Many people in rural areas live in simple, but more spacious, log houses. Novosibirsk is the largest city in Siberia, with a population of about 1.5 million, followed by Yekaterinburg (1.3 million, Urals), Omsk (1.1 million), Chelyabinsk (1.07 million, in the Urals), Krasnoyarsk (0.91 million), Barnaul (0.60 million), Irkutsk (0.59 million), Kemerovo (0.52 million), Tyumen (0.51 million), Tomsk (0.48 million), Nizhny Tagil (0.39 million, Urals), Kurgan (0.36 million), Ulan Ude (0.36 million), Chita (0.32 million). The above count, however, by including the entire Urals Federal District, includes areas not usually considered part of Siberia, e.g. the cities Yekaterinburg and Chelyabinsk and Nizhny Tagil listed above. Most Siberians (close to the average measured over all of Russia of 79%) are Russians and Russified Ukrainians, but in certain Oblasts (e.g. Tuva), Slavic population is as low as 20%. Most non-Slavic groups are Turkic. Smaller linguistic groups are Mongols (ca. 600,000 speakers) Uralic (Samoyedic, Ugric, Yukaghir; roughly 100,000 speakers), Manchu-Tungus (ca. 40,000 speakers), Chukotko-Kamchatkan (ca. 25,000 speakers), Eskimo-Aleut (some 2,000 speakers), and languages isolates, Ket and Nivkh. Mongolian, Turkic and Manchu-Tungus languages are sometimes taken together under the term Altaic. Uralic and Altaic form the Ural-Altaic group, and the Uralo-Siberian group combines the Ural-Altaic with the Chukotko-Kamchatkan group. These are more umbrella terms than accepted linguistic relationships. This last part is the most interesting for me. There are also some interesting links at the bottom of the page, this will be tomorrow’s homework. I see that they do not include the territories that are next to the Bering Strait and Kamchatka. So separate searches for them too. Siberian, Native American Languages Linked. A First. A fast-dying language in remote central Siberia shares a mother tongue with dozens of Native American languages spoken thousands of miles away, new research confirms. The finding may allow linguists to weigh in on how the Americas were first settled, according to Edward Vajda, director of the Center for East Asian Studies at Western Washington University in Bellingham. Since at least 1923 researchers have suggested a connection exists between Asian and North American languages—but this is the first time a link has been demonstrated with established standards, said Vajda, who has studied the relationship for more than 15 years. Previous researchers had provided lists of similar-sounding and look-alike words, but their methods were unscientific. Such similarities, Vajda noted, are likely to be dismissed as coincidence even if they represent genuine evidence. So Vajda developed another method. “I’m providing a whole system of [similar] vocabulary and also of grammatical parallels—the way that verb prefixes are structured,” he said. His research links the Old World language family of Yeniseic in central Siberia with the Na-Dene family of languages in North America. The Yeniseic family includes the extinct languages Yugh, Kott, Assan, Arin, and Pumpokol. Ket is the only Yeniseic language spoken today. Less than 200 speakers remain and most are over 50, according to Vajda. “Within a couple of generations, Ket will probably become extinct,” he said. (Related news: “Languages Racing to Extinction in 5 Global ‘Hotspots’” [September 18, 2007].) The Na-Dene family includes languages spoken by the broad group of Athabaskan tribes in the U.S. and Canada as well as the Tlingit and Eyak people. The last Eyak speaker died in January. Vajda presented the findings in February at a meeting of linguists at the Alaska Native Language Center in Fairbanks. Johanna Nichols is a linguist at the University of California in Berkeley who attended the Alaska meeting where Vajda presented his research. With the exception of the Eskimo-Aleut family that straddles the Bering Strait and Aleutian Islands, this is “the first successful demonstration of any connection between a New World language and an Old World language,” Nichols said. Vajda said his research puts linguistics on the same stage as archaeology, anthropology, and genetics when it comes to studying the history of humans in North Asia and North America. However, the research has not revealed which language came first. Neither modern Ket nor Na-Dene languages in North America represent the mother tongue. For example, some words in the Na-Dene family likely represent sounds of the mother tongue more closely than their Yeniseic cognates. Other words in Yeniseic, however, are probably more archaic. Based on archaeological evidence of human migrations across the Bering land bridge, the language link may extend back at least 10,000 years. If true, according to Vajda, this would be the oldest known demonstrated language link. But more research is needed to determine when the languages originated and how they became a part of various cultures before such a claim will be accepted, according to UC Berkeley linguist Nichols. “I don’t think there is any reason to assume the connection is [10,000 years] old … this must surely be one late episode in a much longer and more complicated history of settlement,” she said. Being a linguist myself, I am thrilled with that discover. This is very good news, congratulations for the researchers! Let’s see if this helps conserving and increasing the use of all those forgotten languages.